For those of us of a ‘certain age’ the 1960’s heralded the golden age of a TV programme that to this day is still a national institution and no week would have been complete without a couple of trips through the cobbled streets of Weatherfield, past the Rovers Return and into Coronation Street. At a time when the slightly baffling phrase ‘soap opera’ had yet to be coined Coronation Street was something truly unique – a weekly, working-class drama shot through with typical Northern wit and grit. For the first time, visionary writers and producers had given the public ‘real’ people whom they could relate to and believe in. So real at times you almost wondered whether you were watching the TV or whether your mum & dad had knocked a hole through the living room wall to spy on the neighbours! If one person should be remembered more than any other for the warmth, humour and compassion that he breathed into the characters back then, it has to be Jack Rosenthal – one of the finest writers and dramatists to work on British television. He wrote for his characters with feeling and a clear understanding of what went on in the hearts and minds of ordinary folk because he wrote from his own experience and of those around him. Now, thanks to the vision of the Lass O’Gowrie landlord, Gareth Kavanagh and the generosity of ITV and Jack Rosenthal’s family we are presented with a unique opportunity to step back in time to 1968 and relive the wedding of Dennis Tanner and Jenny Sutton in the form of live theatre – something never before done from these scripts. 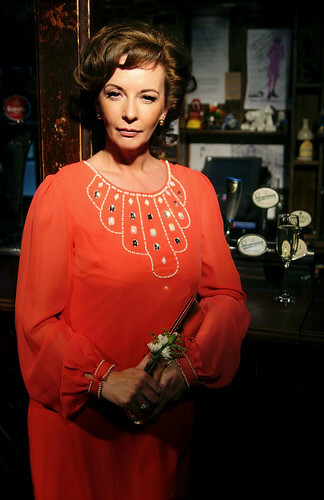 Performed in ‘promenade’ style the scenes take place between the bar area and the rear of the pub – furnished as Elsie Tanner’s and Minnie Caldwell’s homes. As the audience awaits the commencement of the performance we are treated to a deeply moving but also splendidly humorous introduction to the evening from Maureen Lipman – not only a wonderful actress herself but also, of course, the widow of Jack Rosenthal. The evening was also acting as a fund raising event for the charity Myeloma UK as this was the disease that sadly took Jack’s life in 2004 and tears filled Miss Lipman’s eyes along with most of those listening, as her moving and tender recollections of her husbands humour and personality served as perfect preparation for the performance ahead. The actors and actresses who originally occupied the roles portrayed tonight have moved into TV folklore making the challenge for tonight’s cast a tough one indeed - but how brilliantly they all rise to it. The combination of a wonderful script, fine acting and the lack of separation between performers and audience creates a hugely enjoyable feeling of involvement. 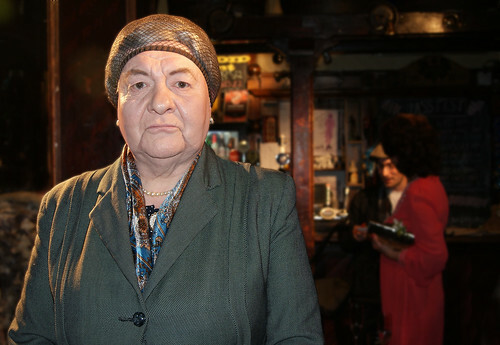 I certainly never envisaged an evening where one moment Elsie Tanner would ease past saying “excuse me chuck” followed swiftly by Ena Sharples brushing me aside without a word – brilliant! It’s no mean achievement either for the cast to make those characters their own in the space of just two ‘episodes’ but each and every one deserves huge credit for the way in which they did, as should June West who has brought them together for the production along with director Helen Parry. Jack Rosenthal had a unique way of working with the light and shade of human emotions and scenes such as Jerry Booth’s unnoticed departure from the wedding reception and from the Street itself was a perfect example, drawing little sighs of sadness from the audience. Val Tagger as Minnie Caldwell served us up a reminder that there was depth and wisdom behind the giddy ways that so often riled Ena with David Crowley & Amy Searles as Dennis and Jenny perfectly conveying their fears and uncertainties as their big day looms. Every great show has it’s icons however and they don’t come any bigger than Ena Sharples and Elsie Tanner – two ladies who could hardly be more different in character, looks and personality and yet despite their many toe to toe battles an element of mutual respect burned quietly within. Where the idea of casting Russell Dixon as Ena came from I have no idea but although the very thought may have set Violet Carson’s hairnet alight it was a truly inspired move as he plays the role brilliantly and the merest stony glance was enough to take the head off your pint! Also perfectly suited for her role was Jeni Howarth Williams who not only portrayed the glamour and sexiness of Elsie Tanner perfectly but also possessed the ability to allow a glimpse beneath the glossy exterior to a place where her often broken heart longed to make a connection with her beloved son before he left her home. As the story drew to a conclusion I found myself in the wonderfully surreal situation of standing in ‘Minnie Caldwell’s’ parlour side by side with Maureen Lipman – her face lit with a smile of approval as the applause rang out around the venue accompanied by the famously haunting trumpet solo familiar to us all. With wonderful generosity both Russell Dixon and Jeni Howarth Williams took the time to chat after the performance and along with everyone else present they were delighted with how successful the night had been. Russell spoke passionately of how much the writers of today could learn from the likes of Jack Rosenthal and the style in which shows and the characters were created back then and Jeni shared her delight that the night felt like a celebration of Jack’s script and that the iconic characters had been the stars with the cast and audience coming together as one to share the experience. I can only hope that all of those involved see fit to allow us the pleasure to take a stroll down that famous cobbled street again some time soon.